Wicked is not just a musical, it is a phenomenon. Every week, 15,000 people pack New York's Gershwin Theatre to see the show. The most successful musical on Broadway in 2004, Wicked is based on the bestselling novel of the same name by Gregory Maguire. It tells the story of Elphaba, the headstrong Wicked Witch of the West, and Glinda, the good witch, growing up in the Land of Oz. The show has cast a spell on fans, many of whom return for second and third viewings. In 2005, the show begins an extensive tour across the United States and Canada, hitting major cities such as Toronto, Chicago, Los Angeles, San Francisco, Washington, D.C., and many more. This beautifully packaged, whimsical keepsake is designed to resemble the Grimmerie, an ancient book of spells that Elphaba uses in the show. 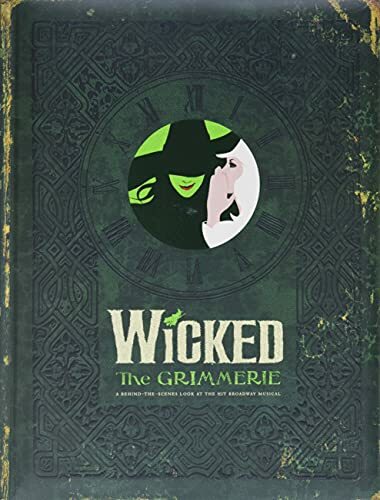 Wicked: The Grimmerie offers fans a behind-the-curtains peek at the musical, profiles of the cast and creative team, and inside stories, with full-color photographs throughout. Some of the irresistible special features include an "Ozian" glossary, spells, an illustrated family tree, and a step-by-step look at how Elphaba gets green before each show--everything fans need to relive the Broadway experience day after day.